The Seattle Christchurch Sister City Association builds a valuable international connection through a wide range of activities. One of the Association goals is to broaden awareness of New Zealand in Seattle through the building and installation of exhibits and artifacts in areas of our most visited public places. Progress can be seen at Woodland Park Zoo with the kea exhibit. 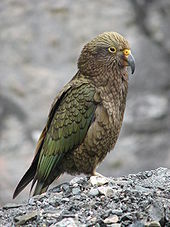 Keas are colorful New Zealand parrots common in the mountain areas of the Southern Alps. The Association sponsors a glade of New Zealand plants, trees and shrubs at the University of Washington Arboretum. In addition, there is a Maori art exhibit at the Burke Museum. Started in 1979 by Ken and Rachel Jacobsen, the New Zealanders of Seattle is a social group for New Zealanders and those interested in New Zealand, living in the Seattle area. The group meets three times a year. In February, we celebrate Waitangi Day on the Saturday afternoon nearest to February 6th. We usually meet in a pub,talk, eat and drink. For the past several years, it has been held at the Kangaroo and Kiwi Bar in Seattle —they serve meat pies and other good New Zealand food! In July we have a Hangi and summer picnic for the entire family, which have been great successes. We have managed to get New Zealand lamb, and also cook pork and chicken. Potatoes, sweet potatoes, squash, parsnips, onions and carrots are also prepared and served. Everyone brings a salad or dessert to share. People play cricket, raft on the pond or just chat. There is a lolly scramble for all ages.